Visual indication using light emitting diode becomes very common, because LED technology offer many benefits: low power consumption, durable, and cheap. Some indication must be able to draw strong attention, or at least it must be very clear to read whether its state is on of off. In some application, the requirement of very low power consumption becomes important, and the circuit in this article provide the solution. By briefly blinking a LED, the average power consumption will be very low compared to continuous operation. The peak current of the LED is set at higher value to produce a bright light flash, but since it works in very short duration then the total power will be very small. Figure 2 shows the schematic diagram of the circuit. The circuit will flash the LED in a repetitive period of about 0,6 second, which lower the average current consumption down to 200 uA (from normally 20 mA). The peak current is about 100 mA and it is enough to give a normal brightness perception as the brief flashing compensation. The circuit works by letting C1 to be charged through R2, until the voltage at U1 D reach the point where it activate all the gates and turns on the TR1 transistor. Once activated, the transistor will discharge the capacitor C1 through LED D1. The LED D1 will flash and empties the capacitor, dropping the voltage of U1D input down to its deactivating level, restarting the cycle back to the charging again. 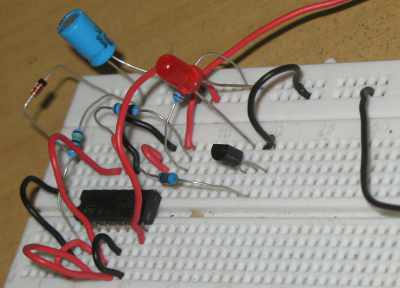 Show how the circuit works in the following video.